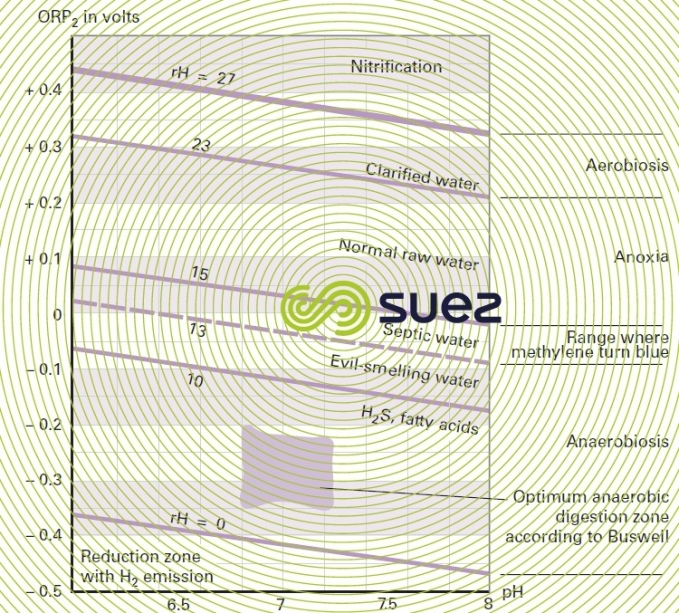 Household wastewater that is sufficiently "fresh" will have an oxidation reduction potential of approximately 100 mV which, for a pH in the region of 7, produces an rH of 17 to 21 (see oxidation-reduction). A potential of less than + 40 mV (i.e. rH = 15 for a pH = 7) or a negative potential will be characteristic of a reducing medium (septic water, putrid fermentation, presence of reducing agents). A potential of more than 300 mV (i.e. rH = 24 for a pH = 7) is indicative of an abnormal oxidising medium (large amounts of water entering the system: rain – spurious water). In the presence of SO42‑, the effluent’s septicity will result in the formation of sulphides (S2-) and cause H2S, as well as corrosion, to be emitted to the network. Figure 22 classifies water according to pH and rH. water dwell time in the networks and, therefore, the length of these networks and flow velocity through said networks. Thus, on the longer networks (dwell time > 12 h) and at temperatures of 20°C, we go from between 5 and 10 ppm S2- to between 20 and 30 ppm at temperatures of between 25 and 28 °C, and even from 50 to 70 ppm in the case of prolonged transfers taking approximately 24 hours in hot countries when water contains more than 300 ppm SO42-.